On October 15th I gave advance notice of a yacht auction to be held in Nice this Saturday, October 24th; now Lisa Peck of YCO tells me that Falcon's 32.4m megayacht Harlequin will join the auction. Viewings are in the port of Nice from 10am to 6pm on Friday, October 23rd and Saturday, October 24th from 10am to 12 noon. The auction itself will be held at 2:30pm on Saturday at 15 Rue Dante, Nice. But now back to _Harlequin _herself. Delivered in 2001 and fully refitted in 2007, the luxury yachts's currently on the market through Anthony Rees. 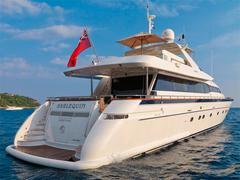 Guests are accommodated in a full beam master, VIP double and two twins and her asking price is €2.5 million, although bidding will start at €1.5 million.